Teaching and mentoring have always been part of the life of Andrew Manns, the UVa Law 3L chosen as the recipient of this year’s Rosenbloom Award. The award honors one student per year with a strong academic record “who has significantly enhanced the academic experience of other law students by volunteering support and assistance to them.”1 Originally from Leicester, Vermont, Manns graduated with a degree in government from Dartmouth College in 2011. Before coming to UVa, Manns spent three years teaching—two in Brooklyn and the other in Austin, Texas. “My parents always cared a lot about education, and I always enjoyed teaching and mentoring,” Manns said. While in Brooklyn, Manns taught special education, primarily with dyslexic fifth- and sixth-graders, as a part of the Teach for America program. He described his experience as “very rewarding.” In Austin the next year, Manns taught reading and writing to sixth-graders and continued to help with special education. Both districts faced substantial challenges; more than ninety percent of pupils in each district received free or discounted lunches due to low incomes. Those challenges made the work all the more rewarding for Manns, who saw the disadvantaged areas as fertile ground for the helping hand of a teacher. So how does a sixth-grade reading teacher end up on track to be a lawyer? Easy, Manns said. As a teacher, he felt like he was in the trenches fighting social inequality head-to-head. “You work with and help your students succeed,” he said, “but you can’t do as much as you want to.” Manns sees the job of a lawyer as working to alleviate the greater causes of systematic social problems. With that goal in mind, Manns hopes either to work for the Department of Justice or to get into academia. First, though, Manns has two years of clerking ahead. After graduating, he will clerk for Judge T.S. Ellis III of the United States District Court for the Eastern District of Virginia. After that, he’s off San Francisco to clerk for Judge William A. Fletcher of the Ninth Circuit Court of Appeals. Manns said he selected his judges based on their penchant for mentoring clerks. 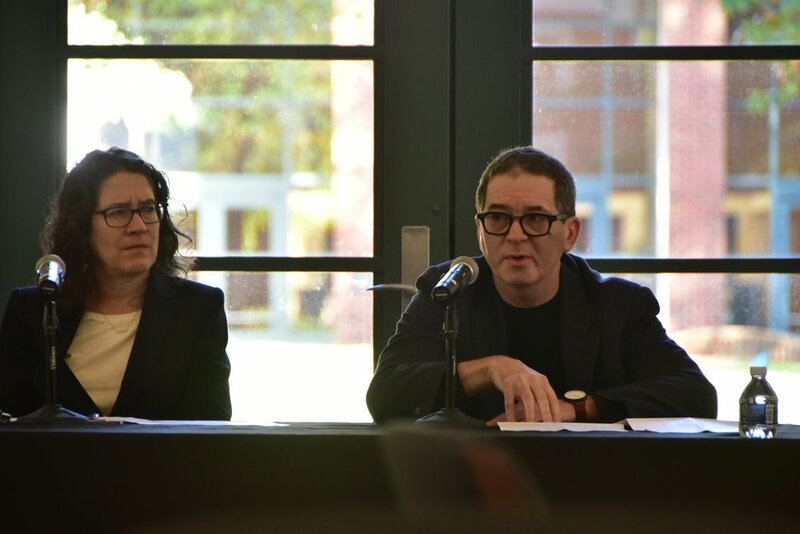 As for advice about clerking, “Don’t count yourself out,” Manns said, noting that UVa professors are excellent resources with deep connections to many judges. Manns’ mantra about clerking would make Ruth Payne proud: anyone who wants to clerk and is willing to work for it can clerk, he said, and he highly recommends that even skeptics look into the idea. While Manns has been involved with a wide range of activities while at UVa Law, the one he recalled most fondly was his time as a Research Assistant (RA) to Professor Rachel Harmon, whom he called “amazing.” While working with Professor Harmon, Manns had the opportunity to help her write a casebook and assist her in crafting other legal writings. He recommended that anyone who has the chance to take Professor Harmon’s Criminal Procedure class or Law and Police seminar seize the opportunity to do so. After lauding Manns’ academic accomplishments, Professor Harmon had effusive praise for what she called “his unfailing commitment to helping other students.” Professor Harmon claimed to have taken advantage of that quality often. “At my request,” she said, “he has advised several classmates and trained a bunch of my newer research assistants.” She went on to say, “All told, Andrew is a great illustration of UVa Law’s best qualities, and I will be sorry to see him graduate.” Assistant Dean of Student Affairs Sarah Davies echoed Professor Harmon’s warm comments: “Andrew embodies UVa’s spirit of community,” she said. In addition to his position as an RA to Professor Harmon, Manns also served as an Articles Editor for the Virginia Law Review (“Sometimes you have to teach the professors things, like the Bluebook”) and as a Dillard Fellow. The latter position, yet another teaching and mentoring role, is, according to Manns, a great way to give back and get to know first-year students. Manns’ enthusiasm for teaching was evident in the giddy excitement with which he talked about his role as a Dillard Fellow. His past as a teacher, he said, helped him get students motivated for Legal Research and Writing, which first-year students sometimes find difficult. He also enjoyed watching students’ writing progress and their confidence grow from the beginning of fall semester to the time the first-year brief is turned in. Dean Golubuff’s final remark before giving former Attorney General Loretta Lynch the podium last Thursday, April 13, was, “It is not only that she has done amazing things, but she will inspire you to no end.” Dean Golubuff, holding true to Virginia Law’s vaunted Honor Code, did not lie. 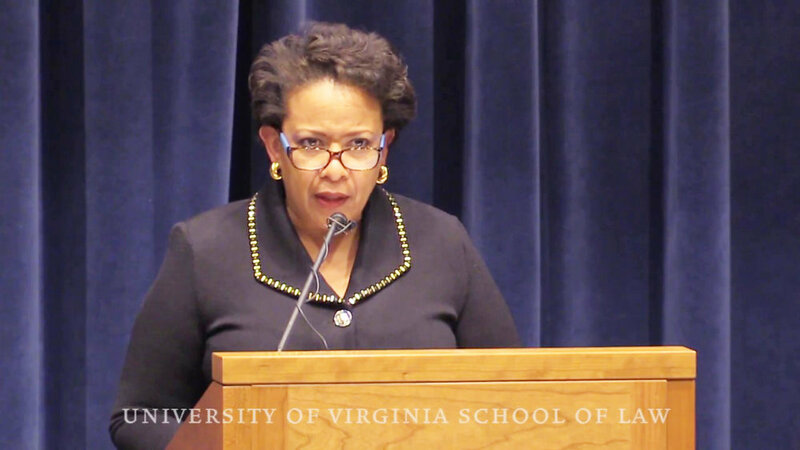 As the granddaughter of a sharecropper and the second black person, second woman, and first black woman to assume the title of the nation’s top law enforcement officer was welcomed to the podium by the first woman dean of UVa Law, it was hard to not to recognize the historic irony and symbolic significance of the moment. As she bestowed the Thomas Jefferson Foundation Medal in Law upon General Lynch, the University of Virginia acknowledged “the contradictory nature of its founder,” as General Lynch artfully put it. Representing the University of Virginia’s highest external honor, the Thomas Jefferson Foundation Medal is awarded jointly by the University and the Thomas Jefferson Foundation, the nonprofit organization that owns and operates Monticello. The award is also issued in architecture, civil leadership, and global innovation. General Lynch’s remarks, titled “The Role of Lawyers in a Post-Truth World,” were given in acceptance of the award. “When we do confront a truth, if that truth is uncomfortable or challenging, do we turn towards it to expand our world? Or do we simply yell our views more loudly? Where is our pursuit of truth today?” General Lynch began. Over the course of the next forty minutes, General Lynch wove together a narrative that explained the role of an attorney: the empathizer, the justice seeker, the nuanced observer, but, above all, the champion of and for the truth. “You are all entitled to your own beliefs, but you are not entitled to your own facts,” General Lynch fervidly declared, alluding to Daniel Patrick Moynihan’s famous maxim. Continuing in this vein, she emphasized that mere repetition of a claim does not make it true. On the contrary, General Lynch propounded the idea that truth is the product of maintaining a breadth of perspective and “the openness of mind necessary to see both sides of an issue,” or, as the case may be, all facets of a problem rather than a simple dichotomy of black and white. It was clear that in her mind, truth unblinded by dogma is the foundation of law, which in turn is the most powerful tool with which to fight injustice and promote equality. “Facts mean truth, and once we adhere to truth, the law comes to our aid naturally,” is a Gandhi quote which General Lynch repeated for emphasis. Throughout her remarks, General Lynch grounded her reasoning in anecdotes from her life in public service, including as Attorney General and U.S. Attorney for the Eastern District of New York. She advocated for a fact-based approach to voting rights and in implementing community policing initiatives, noting that those communities with the most successful such initiatives have made pointed efforts to include the people whom they are meant to protect in planning them. Additionally, General Lynch emphasized the importance of public service regardless of which political party is in power, noting that, even if on a personal level one does not support policies being implemented or believe they serve justice as one may hope, there is valuable training to be had, and ultimately such experience may prove valuable in attaining leadership positions through which greater influence may one day be exerted. It was evident from the time the law school announced the title of General Lynch’s speech that the 2016 presidential election would loom heavily over the talk. However, aside from a few brief mentions, General Lynch refrained from directly referencing the election or mentioning names. Instead, the former Attorney General opted for a broader theme of how distrust erodes the foundations of democracy and how common truths must be accepted by all. In particular, General Lynch built on the idea that because truth is not the sole property of one faction of a conflict and, rather, each side’s unique reality informs its perspective, the distillation of all sides’ truths is necessarily the starting point of successful problem-solving. In searching out truth and considering these dual perspectives and realities, compassion and understanding are key. Finding a platform from which to solve the existing problem is the paramount consideration, not convincing the opposing side that they are wrong. Unless such common ground can be found—whether in public or private practice—there can be no solid ground from which to build a solution. As General Lynch succinctly put it, whenever a client walks in the door, his or her complaint is likely only a symptom of an underlying problem. In order to figure out the true concern, it is necessary to actually spend time with them. More than a year after Justice Antonin Scalia died unexpectedly, the Senate last week confirmed Judge Neil Gorsuch of the Tenth Circuit Court of Appeals to take Scalia’s place on the Supreme Court; he was sworn in earlier this week. Gorsuch was confirmed Friday by a vote of fifty-four to forty-five, with three Democrats joining all fifty-one present Republicans to confirm President Donald Trump’s nominee for the nation’s highest court. A day before, the Republican majority failed to overcome a Democratic filibuster of Gorsuch’s nomination, with only fifty-five of the sixty senators needed voting to move Gorsuch’s nomination forward. In response, Senate Majority Leader Mitch McConnell (R-Ky.) invoked the so-called “nuclear option,” replacing by majority vote the longstanding sixty-vote threshold for Supreme Court nominees with a simple-majority requirement. The battle to name Scalia’s replacement has roiled the Senate and drawn cries of hypocrisy from Republicans and Democrats alike. In March of last year, then-President Barack Obama nominated Judge Merrick Garland of the D.C. Circuit Court of Appeals to take Scalia’s place, but the Republican-controlled Senate declined to act on Garland’s nomination. Shortly after Obama announced Garland as his pick, McConnell, citing Senate tradition, announced the Senate would refuse to hold hearings or a vote on any nomination made for the Supreme Court during the year of a presidential election. Democrats cried foul, noting Garland’s sterling credentials and moderate profile. They decried Republicans’ refusal to hold hearings on Garland’s nomination as a breach of Senate norms and an escalation of the judicial nomination wars that have raged in the Senate for decades. The nuclear option has been looming over judicial nominations for more than a decade. Invoked for lower court nominations by then-Senate Majority Leader Harry Reid (D-Nev.) in 2013 to end what Obama called a “pattern of obstruction,” the procedural change to allow simple-majority cloture for judicial nominees was floated most prominently in 2005 by Republicans frustrated with Democrats’ filibuster of several of then-President George W. Bush’s lower court nominees. That crisis was averted by the efforts of the so-called “Gang of 14,” a bipartisan group of senators that agreed to allow streamlined consideration of Bush’s nominees while keeping the sixty-vote threshold in place. This week, that agreement proved to be a temporary reprieve for the Senate’s beleaguered sixty-vote threshold. Each side blames the other for the escalation in the judicial wars. Republicans point to Democrats’ defeat of Robert Bork’s nomination to the Court in the 1980s and Reid’s invocation of the nuclear option for lower court nominees in 2013. Democrats counter by accusing Senate Republicans of an unprecedented blockade of lower court nominees during the tenures of Obama and President Bill Clinton. Few deny that judicial nominations have become vastly more polarized along partisan lines in recent decades. Within living memory, Supreme Court nominations were relatively uncontroversial affairs. In 1986, Scalia was approved with ninety-eight senators voting aye and none voting to reject, while his ideological opposite Justice Ruth Bader Ginsburg was approved ninety-six to three just seven years later. Such margins are unimaginable today. While Chief Justice John Roberts was approved with seventy-eight votes in 2005, bipartisan support for nominees has waned recently, with Justices Samuel Alito, Sonia Sotomayor, and Elena Kagan all receiving fewer than seventy votes despite solid credentials. Meanwhile, lower court nominees of presidents of both parties have met with increasing obstruction. Republicans declined to hold hearings for many of President Clinton’s lower court nominees in the late 1990s, while Democrats successfully filibustered several Bush nominees and delayed many others in the mid- 2000s. No matter on whom can be laid the blame for the increasing bitterness of the battles over presidents’ nominees to fill the courts, Republicans’ decision to deploy the nuclear option works in their favor, at least in the short term. Scalia’s seat will now be filled by Gorsuch, seen by most as a reliable conservative during his time on the Tenth Circuit Court of Appeals. While Scalia was a symbol of American judicial conservatism, his devotion to originalism occasionally led him to side with the Court’s liberals on such issues as the Sixth Amendment’s Confrontation Clause and the permissibility of technologically advanced searches and seizures under the Fourth Amendment. It is unclear if Gorsuch holds similar idiosyncrasies, or if his jurisprudence will tend more toward the mold of a conventional conservative like Alito. Assuming Gorsuch fulfills the ideological expectations of critics and supporters alike, hisconfirmation leaves the Court in roughly the same ideological position it held before Scalia’s death: four more-or-less conservative justices, four more-or-less liberal justices, and conservative-leaning-but-swingy Justice Anthony Kennedy. Kennedy will celebrate his eighty-first birthday this summer, and Ginsburg, the ideological heart and soul of the Court’s liberal wing, just turned eighty-four. Should either Kennedy or Ginsburg retire in the next three years, the Court would be poised for a dramatic ideological shift to the right. With the sixty-vote threshold for Supreme Court nominees now a thing of the past, little would stand in the way of Trump filling either seat with another name from the list of possible justices he provided during the campaign. Any of those jurists would likely be far more conservative than Kennedy and Ginsburg. For now, the Senate’s nuclear showdown looks like a major win for Trump and Senate Republicans. But political winds shift, and no party remains in control forever. What looks like a clear-cut victory for Republicans today will likely aid Democrats one day as well. One thing is certain: the partisan battles that have politicized Supreme Court nominations show no sign of abating. Bitter though the fight over this vacancy surely was, the Senate’s decision to go nuclear means there is no reason to believe the next vacancy will prove any smoother. What do you think about putting solar panels on the rooftops of UVa Law? Would you care if you could see them or not? What if they paid for themselves in ten years or fewer? You wouldn’t be the first person to think about it. Our law school is actually a pretty good candidate for rooftop solar panels. Anyone who enjoys being outside in the courtyard knows why. We’re in a sunny spot: a simple truth we can capitalize on. Some estimates suggest the average payback period for rooftop solar instillations is seven years, after which time the system begins making money. Whether or not you’re excited about solar as way of reducing emissions, putting solar panels on the roof could save the Law School money on its energy bills. Those funds could then be spent on other important law school expenditures, like buying fancy lunches for students. In 2009, the University of Virginia Board of Visitors (BOV) pledged to reduce the University’s green house gas emissions twenty-five percent by 2025. Thus far, UVa is not on track to meet its emissions reduction goal. The production, use, and conservation of energy are the primary challenges preventing UVa from meeting its reduction target. The University has engaged in the easiest actions to reduce emissions. There was a noticeable five percent reduction in emissions between 2014 and 2015; however, the warmer weather, increased use of natural gas, and emission reductions from stationary sources accounted for 144 percent of this promising statistic. In order for UVa to meet its reduction objective, the administration will need to take bolder action. Notably, in 2016 and early 2017, the BOV and the Grounds Committee made sustainability a major goal for the upcoming year. For the first time, the Office of Sustainability is currently working on step one of a Carbon Action Plan and a Rooftop Solar Inventory. In December of 2016, Facilities Management and the BOV announced a 21 Megawatt King William County solar facility with Dominion Virginia Power. Darden Business School is actively participating in the project. By 2020, Darden’s portion of the project will enable the school to achieve its carbon neutrality goal for Scope 2 emissions. Darden’s administration is also considering rooftop solar panels for its parking deck to address Scope 3 emissions. Currently, UVa is evaluating a second utility-scale solar project with Dominion. By installing solar panels on the roof of the Law School, UVa Law has an incredible opportunity to help the University in totality with its greater greenhouse gas emission goals, while also significantly decreasing its own carbon footprint. 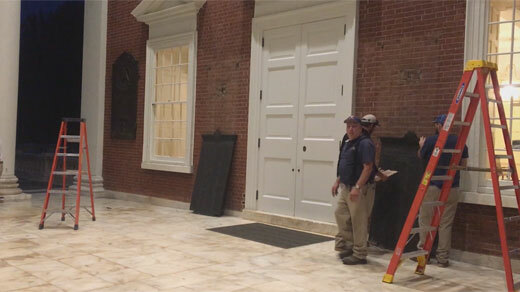 UVa facilities management is currently considering the possibility of placing solar panels on the roof of the school. A recent estimate of our rooftop’s potential suggests we could install a 575 kW system, one that could generate an estimated 752,596 kWh a year, or fourteen percent of the school’s current electricity load. The Law School could engage in a structured power purchase agreement, which is a financial contract that provides a price hedge against increasing energy prices and generates renewable energy certificates to offset greenhouse gas emissions. Understandably, questions regarding cost may arise when discussing alternative energy installations. A study by the Sustainable Endowments Institute evaluating seventy-nine green revolving funds in 2012 found a median return on investment of twenty-eight percent and a median payback of three and a half years. Let’s just say I wish my payback plan for law school had such a short-term payback schedule. In addition to cost savings, UVa, and more specifically the Law School, have other key reasons to prioritize a reduction of greenhouse gas emissions. Investments in renewable energy and energy efficiency mitigate long term exposure to fuel price volatility. Also investments have the ability to mitigate long-term exposure to a potential carbon tax and negative public relations, as climate related events reflect back on the actions of major institutions. Furthermore, UVa law has the unique potential to demonstrate leadership in the field of alternative energy. UVa has failed to invest in energy efficiency at the same rate as other comparable universities. UVa has invested approximately one million dollars into energy efficiency funds compared to the 12 million invested by Harvard or the 10 million invested by Stanford. Investment in solar energy by UVa represents a valuable chance for the school to lead in large-scale sustainability and lend credibility to both the promises made by the BOV, as well as the phenomenal scholarship produced by the school on the topic of alternative energies. As law students, we are in an exceptional position to help UVa bring solar panels to the Law School and meet more general goals in the reduction of greenhouse gases. The Law School could set its own emissions reduction goal. This goal would likely be easily met through an investment in rooftop solar and participation in a structured power purchase agreement. UVa’s facilities management is already considering the possibility of rooftop solar panels for the Law School. As law students, we can use our voices to promote a positive viewpoint on investments into solar energy and show a greater overall commitment to leaving the Law School a cleaner, greener, and more sustainable place for future Wahoos.